Most frequently occurring in the abdomen, these tumors can grow wherever sympathetic nervous tissue is found. Common locations for ganglioneuromas and ganglioneuroblastomas include the adrenal gland, paraspinal retroperitoneum (sympathetic ganglia), posterior mediastinum, head, and neck; it is uncommon to find them in the urinary bladder, bowel wall, abdominal wall, and gallbladder. See the images below. This frontal chest radiograph shows a right paraspinal well-defined density in the retrocardiac region. The right cardiophrenic angle appears normal. T1-weighted magnetic resonance images of a ganglioneuroma. The sagittal views demonstrate a well-defined, solid mass located slightly anterior to the midthoracic vertebral bodies. The mass extends into and widening multiple neural foramina. Flow voids within the lesion represents vascularity. This axial noncontrast computed tomography image of a ganglioneuroblastoma demonstrates a large, left heterogeneous paraspinal lesion with speckled calcifications that are predominantly peripheral. 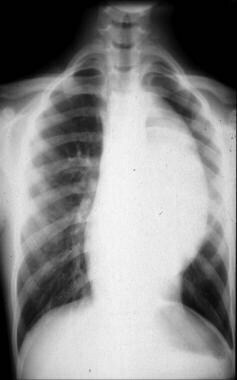 The mass is displacing the mediastinum to the right. In general, neuroblastic or neurogenic tumors appear radiologically as well-circumscribed, smooth or lobulated masses that may contain calcifications. The benign (ganglioneuromas) and malignant (ganglioneuroblastomas) forms of these tumors are virtually identical radiologically. The only differentiating factor is the possibility of distant metastases with malignant ganglioneuroblastomas. 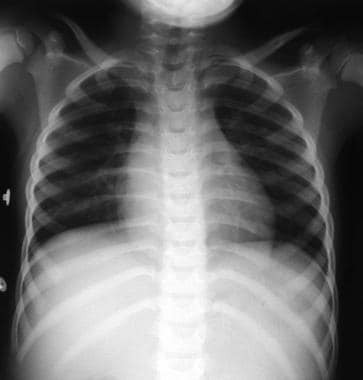 Ganglioneuromas are typically discovered on a routine radiograph. However, on radiologic examination, all neuroblastic tumors (ie, ganglioneuroblastomas, ganglioneuromas, and neuroblastomas) look similar. The main difference is that ganglioneuroblastomas and neuroblastomas can possibility metastasize. Frontal chest radiograph shows a large left paraspinal density. The lesion is silhouetting the aorta and, on the lateral view in the next image, appears to be retrocardiac and in close proximity to the vertebral column. 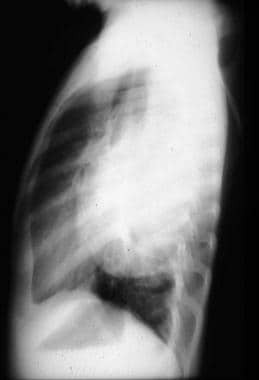 This lateral view radiograph of a ganglioneuroblastoma shows a large, well-defined homogeneous density that appears to be retrocardiac and in close proximity to the vertebral column. Nonenhanced CT scanning reveals a homogeneous mass with less attenuation than muscle. Ichikawa et al described a delayed heterogeneous uptake of contrast in a ganglioneuroma. The reason for this type of uptake is that these tumors take longer to accumulate contrast material in the extracellular space. This delay is directly proportional to the amount of myxoid stroma in the tumor. Ganglioneuroblastomas have a variable appearance on CT scans and can be cystic or solid. Abdominal and pelvic tumors are mostly heterogeneous and large; smaller tumors may appear homogeneous. See the image below. Areas of bleeding and necrosis may be as large as 4 cm and appear to be of lower attenuation. These tumors can grow around blood vessels but rarely invade them. Vessel compression, however, is a realistic possibility. If compression of renal vasculature occurs, hypertension can result. Other vessels at risk include the splenic vein, inferior vena cava, aorta, celiac artery, and superior mesenteric artery (SMA). 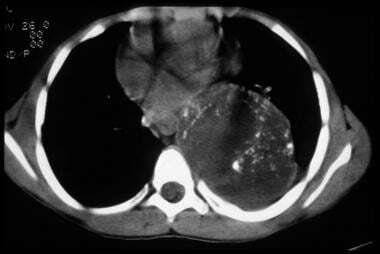 Any metastasis to the liver or lung and adenopathy can also be identified on CT scans. Liver metastases appear as diffuse infiltration (in infants) and as focal areas of low enhancement. Metastatic disease of the lung can appear either as well-defined nodules or as larger areas of tissue consolidation. Although exceedingly rare, brain metastases do occur and have a variable appearance, ranging from hemorrhagic to cystic with rim-enhancement to a solid mass. MRI is a multiplanar imaging technique that creates images with better tissue discrimination than CT scanning. This makes MRI more effective at evaluating organs of origin, regional invasion, and intraspinal tumoral extension. 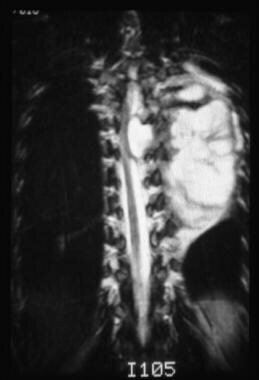 Any patient with a paraspinal tumor should undergo an MRI to evaluate possible tumoral invasion of the epidural space. 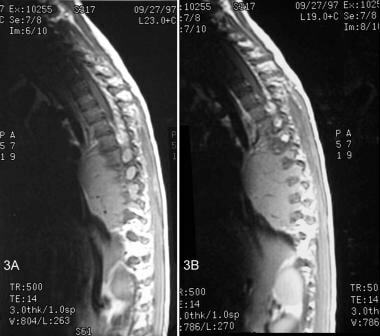 In these cases, coronal, sagittal, and axial views can demonstrate spinal cord and nerve root displacement as well as superior and inferior tumor growth. See the following images. 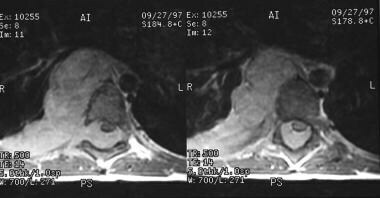 T1-weighted postcontrast axial images of a ganglioneuroma demonstrate homogeneous enhancement of the lesion. The lesion is extending from the right paraspinal region into the epidural space through the neural foramina causing cord compression. Ganglioneuromas have characteristic curvilinear bands of low signal-intensity on T2-weighted images that impart a whorled pattern to the tumor. These bands are composed of collagen fibers and intertwined bundles of Schwann cells. The capsule surrounding the tumor appears as a low-density ring on both T1- and T2-weighted images. Additional MRIs of these tumors are provided below. This coronal T2-weighted image demonstrates a well-defined, lobulated mass with fibrous septations. The mass is extending into the neural foramina and is causing cord compression in the midthoracic region. 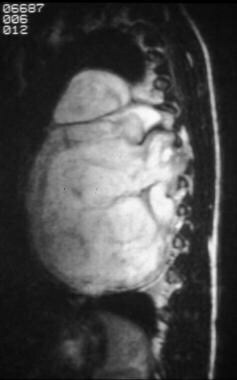 The mass is also displacing the aorta to the right. This coronal T2-weighted image demonstrates a well-defined, lobulated mass with fibrous septations. The mass is extending into the neural foramina. In cases of ganglioneuroblastoma, scintigraphy is not only useful for identifying the primary tumor, but it is also useful for monitoring the pattern of metastatic spread. Primary and metastatic tumors take up catecholamine and somatostatin analogs. Technetium-99m (99m Tc) testing is an initial study done in all patients with diagnosed ganglioneuroblastoma to determine the amount of metastatic disease present; however, as many as 75% of primary tumors also show uptake. This method is preferred for the examination of bone metastases, as cortical and marrow lesions are difficult to discriminate (as they are with MIBG studies). Metastases appear as areas of higher uptake, and they include areas such as the lung and liver. The amount of99m Tc uptake is, purportedly, directly related to calcium metabolism of the tumor cells. Ganglioneuromas can accumulate MIBG in a fashion similar to ganglioneuroblastomas; tumors that uptake MIBG are catecholamine-producing tumors. [15, 16, 17, 18] Although 90-95% of ganglioneuroblastomas produce catecholamines, only approximately 70% take up MIBG. Therefore, negative results do not mean there is no disease. Despite this limitation, MIBG scintigraphy has an 88% sensitivity and a 99% specificity for tumors containing sympathetic tissue, such as ganglioneuroblastomas, ganglioneuromas, neuroblastomas, pheochromocytomas, and carcinoids. The disadvantage is that there is no way to discriminate the type of tumor in which the uptake occurs. When bone is affected, this method also makes staging difficult, because it does not distinguish cortical involvement from marrow involvement. Rha SE, Byun JY, Jung SE, et al. Neurogenic tumors in the abdomen: tumor types and imaging characteristics. Radiographics. 2003 Jan-Feb. 23(1):29-43. De Bernardi B, Gambini C, Haupt R, Granata C, Rizzo A, Conte M, et al. Retrospective study of childhood ganglioneuroma. J Clin Oncol. 2008 Apr 1. 26(10):1710-6. [Medline]. Rabah R, Weber R, Serhatkulu GK, Cao A, Dai H, Pandya A. Diagnosis of neuroblastoma and ganglioneuroma using Raman spectroscopy. J Pediatr Surg. 2008 Jan. 43(1):171-6. [Medline]. Guo YK, Yang ZG, Li Y, Deng YP, Ma ES, Min PQ, et al. Uncommon adrenal masses: CT and MRI features with histopathologic correlation. Eur J Radiol. 2007 Jun. 62(3):359-70. [Medline]. Stutterheim J, Gerritsen A, Zappeij-Kannegieter L, Yalcin B, Dee R, van Noesel MM, et al. Detecting Minimal Residual Disease in Neuroblastoma: the Superiority of a Panel of Real-Time Quantitative PCR Markers. Clin Chem. 2009 May 21. [Medline]. Lonergan GJ, Schwab CM, Suarez ES, Carlson CL. Neuroblastoma, ganglioneuroblastoma, and ganglioneuroma: radiologic-pathologic correlation. Radiographics. 2002 Jul-Aug. 22(4):911-34. [Medline]. Yılmaz B, Toktaş ZO, Akakın A, Demir MK, Yapıcıer O, Konya D. Lumbar Spinal Immature Ganglioneuroma with Conus Medullaris Invasion: Case Report. Pediatr Neurosurg. 2015 Oct 14. [Medline]. Lacreuse I, Valla JS, de Lagausie P, Varlet F, Héloury Y, Temporal G, et al. Thoracoscopic resection of neurogenic tumors in children. J Pediatr Surg. 2007 Oct. 42(10):1725-8. [Medline]. Ichikawa T, Ohtomo K, Araki T, et al. Ganglioneuroma: computed tomography and magnetic resonance features. Br J Radiol. 1996 Feb. 69(818):114-21. [Medline]. Abramson SJ. Adrenal neoplasms in children. Radiol Clin North Am. 1997 Nov. 35(6):1415-53. [Medline]. Benz-Bohm G, Hero B, Gossmann A, Simon T, Körber F, Berthold F. Focal nodular hyperplasia of the liver in longterm survivors of neuroblastoma How much diagnostic imaging is necessary?. Eur J Radiol. 2009 Apr 13. [Medline]. Tanaka O, Kiryu T, Hirose Y, Iwata H, Hoshi H. Neurogenic tumors of the mediastinum and chest wall: MR imaging appearance. J Thorac Imaging. 2005 Nov. 20(4):316-20. [Medline]. Zhang Y, Nishimura H, Kato S, et al. 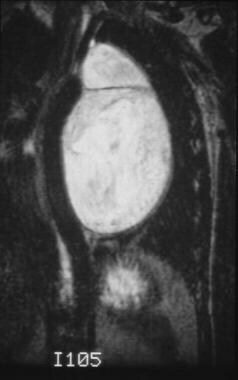 MRI of ganglioneuroma: histologic correlation study. J Comput Assist Tomogr. 2001 Jul-Aug. 25(4):617-23. [Medline]. Gasparetto EL, Rosemberg S, Matushita H, da Costa Leite C. Ganglioneuroblastoma of the cerebellum: neuroimaging and pathological features of a case. Arq Neuropsiquiatr. 2007 Jun. 65(2A):338-40. [Medline]. Ambros PF, Ambros IM, Brodeur GM, Haber M, Khan J, Nakagawara A, et al. International consensus for neuroblastoma molecular diagnostics: report from the International Neuroblastoma Risk Group (INRG) Biology Committee. Br J Cancer. 2009 May 5. 100(9):1471-82. [Medline]. Boubaker A, Bischof Delaloye A. MIBG scintigraphy for the diagnosis and follow-up of children with neuroblastoma. Q J Nucl Med Mol Imaging. 2008 Dec. 52(4):388-402. [Medline]. Vik TA, Pfluger T, Kadota R, Castel V, Tulchinsky M, Farto JC, et al. (123)I-mIBG scintigraphy in patients with known or suspected neuroblastoma: Results from a prospective multicenter trial. Pediatr Blood Cancer. 2009 Jul. 52(7):784-90. [Medline]. Taggart D, Dubois S, Matthay KK. Radiolabeled metaiodobenzylguanidine for imaging and therapy of neuroblastoma. Q J Nucl Med Mol Imaging. 2008 Dec. 52(4):403-18. [Medline]. Fendler WP, Melzer HI, Walz C, von Schweinitz D, Coppenrath E, Schmid I, et al. High ¹²³I-MIBG uptake in neuroblastic tumours indicates unfavourable histopathology. Eur J Nucl Med Mol Imaging. 2013 Oct. 40 (11):1701-10. [Medline]. Shin JH, Lee HK, Khang SK, et al. Neuronal tumors of the central nervous system: radiologic findings and pathologic correlation. Radiographics. 2002 Sep-Oct. 22(5):1177-89. [Medline].